Mighty Media Kids, 9781938063015, 34pp. Betsy loves hanging out with her grandfather, especially at the ballpark. 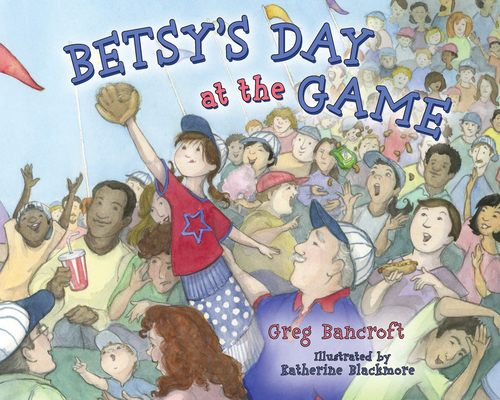 Today is another game day, and Betsy is ready to show her grandpa all she's learned about keeping score. Some exciting things are about to happen at today's game. As the anticipation builds, Betsy keeps track of it all -- foul balls, home runs, and favorite players. Gregory Bancroft's first published children's book is a result of telling stories to children and grandchildren for more than 30 years. An avid baseball fan, he shares an experience of going to a game that mirrors his own time spent with kids at a ballpark. Growing up in a small town in Minnesota, Bancroft and his friends spent a lot of time outdoors. They played baseball nearly every day in the summer. Over the years, he has followed teams in parts of the country where he and his family have lived. He holds degrees from the University of Minnesota, Yale, and Luther Seminary. His professional career spans non-profit organizations and business enterprises across many states. Writing, telling stories, and engaging young minds have been central to his personal interactions for decades. He and his wife live in Minneapolis near Lake Nokomis, while his children and grandchildren are scattered across the country. Katherine Blackmore is one of eleven siblings, born and raised in Cleveland, OH. With a BFA in Illustration from the Cleveland Institute of Art, she has been a professional artist for 20 years. She started out working for American Greetings, designing and creating cards and holiday products. She moved to Florida in 1995 to learn traditional animation at The Walt Disney Feature Animation Studio, and was a Clean-up Animator there for eight years. Her screen credits include: The Hunchback of Notre Dame, Mulan, Tarzan, Lilo & Stitch, and Brother Bear. Throughout her career, she has been an educator as well; she has taught figure drawing and various art classes to students of all ages. She currently teaches 2d animation at a university in Orlando. Blackmore's true love in art is drawing, but she also paints, does collage, and photography; she has numerous hobbies and especially enjoys reading, gardening, traveling, yoga, and hang gliding. She resides in Edgewood, FL, with her husband and their 3 cats.